Put your website on the first page of Google, Bing, and Yahoo! With our proven strategies, you can drive more relevant traffic to your site, get more business, and make more profit. We stay on top of the latest changes to search engine algorithms and help you develop a plan that gets you to the top and keeps you there! The best place to hide a dead body is on page 2 of Google search results. Our SEO strategy begins with tackling your website’s on-page optimization. We’ll evaluate your site structure and other back-end setups to ensure that your website is search engine friendly. We’ll also evaluate the quality of your service or landing pages and optimize them for better rankings online. If necessary, we’ll create landing pages. From there, we’ll develop blogs, centered around your target search terms, to draw visitors, and ultimately, sales to your website. Our off-site strategy involves getting your website listed on 70 top directories, including Google My Business, Bing, Yahoo!, and Yelp. From there, we proceed to claim and update mentions of your business on the web and to researching, requesting, and creating quality links back to your site. If you’re the first business that shows up when someone searches for your service, you’ll get the phone call. We’ll help you get there. 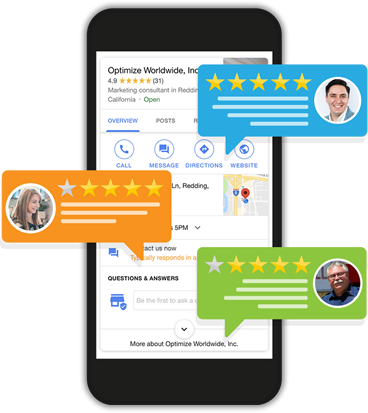 In addition, our proven Review Monitoring services are key to boosting your placement in Google searches and your reputation as a reliable service provider across the web. We will respond to positive customer reviews on your behalf and work with you to write the perfect response to any negative reviews that may be posted online. Don’t let your website fall to the second page of Google or worse. Contact us today to keep your website moving to higher rankings online!